Final day, final quote. As you have seen, I have not obeyed the rules for this tag and tagged more people. Sorry about that. I do urge just about anyone to do this. It is quite fun to search for quotes from your favorite characters and/or movies, anime, tv series and so on. Today, I continue my quest for quotes of Death. 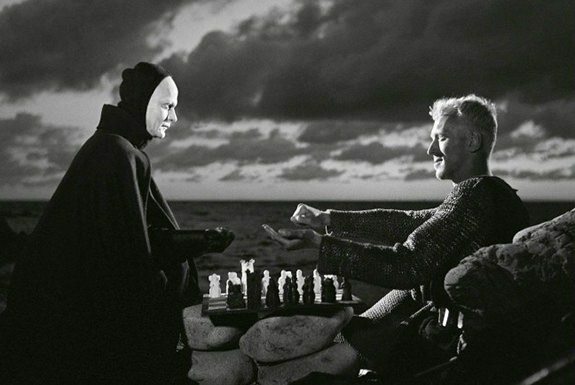 This time we have Death in The Seventh Seal, a movie that is probably defining the very movie culture in Sweden. Ingemar Bergman was a huge director when he was alive. I must admit that I think he is rather overrated but this movie is probably one of his most famous one, and the reason for that is his scene where Death plays chess with Antonius Block. This is not the famous quote but something I feel is fitting for todays climate. Or should be. Death: Do you never stop questioning? Antonius Block: No. I never stop. Isn’t that the point of being alive, to question everything? Aren’t that why God created man and woman in this way? Okey, whatever created humans decided that we should be curious, we should dispute everything. Well, that’s not the case and it is painful to see. Internet is full of people who just accepts whatever someone tells them. It is very real where I live. Racists rule some parts of the internet and people are sheep who just follow the wolf. What happened? Why don’t we question more? It’s dangerous not to but still, people are passive, letting someone else do the thinking and decide what they should and shouldn’t believe. If more people decided to think for themselves maybe this world wouldn’t suffer from flaws such as racism, fascism and/or just lazy [thinking] people. I want people to questions more, authorities and otherwise. Stand up and shout, make a ruckus, be annoying. Ask a question when something seems off. Ask a question when something doesn’t seem off. Check sources, talk to more people, read more, be smart. Antonius Block gets it so why don’t you [we]? Edit: Okey, I got a voluntary nomination after all. 😊 Aria is gonna do it too! Yay! Go check their blog out, there is a lot of goodies. If there is anyone else who’s gonna do it holler at me and I will link to you so that people will find you. I never got to play chess with Death.